Home » How to Get Kids Excited for Bed! Our kids go to bed early-even in the summer. Often there’s still light in the night sky and the neighborhood kids are still out playing while our three are in their pj’s already. I know, we are so mean! I don’t know when we decided to have a firm bedtime for our kids, but that’s just the way we have always done it. Perhaps it was born out of Bryce’s need to have a set schedule and specific times for activities. It’s also because of something else that’s important- Mommy and Daddy need their evenings together! And now that school is starting back up, it’s even more important to have an easy and consistent bedtime routine. Over the years, our bedtime routine has changed a bit, but there’s always been one constant- reading a book before bed. It gives the boys something to look forward to every night-especially when they are being called away from friends still playing outside! 🙂 We’ve read every book in our library dozens of times, and as the boys have gotten older, we’ve started reading through chapter books. Having an early bedtime allows us plenty of time to read with the boys before they go to sleep. 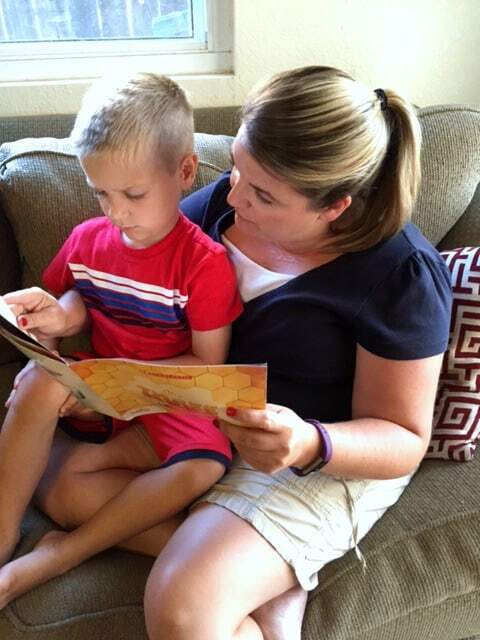 It’s such an important part of early literacy, and I hope it fosters a love of reading and discovery in them. And if they never learn to love to read on their own, they’ll at least have heard hundreds of books being read aloud to them as they grow older. I was so excited to find this list on Scholastic’s Read2Me website! We are always looking for new ideas for what to read at night, and you can even sort the list by age. I was happy to see several books that we either own or have read, and I can’t wait to start working our way through the ones we haven’t read. The book that I’m reading to Charlie in the photo above is called The Three Bees. It’s available to read as an E-book or PDF download at the Read2Me site. It tells the story of a family of bees who decide on a new bedtime routine so they can get a good night’s rest and beat the early birds to the first blooms of spring: BRUSH, BOOK, BED. 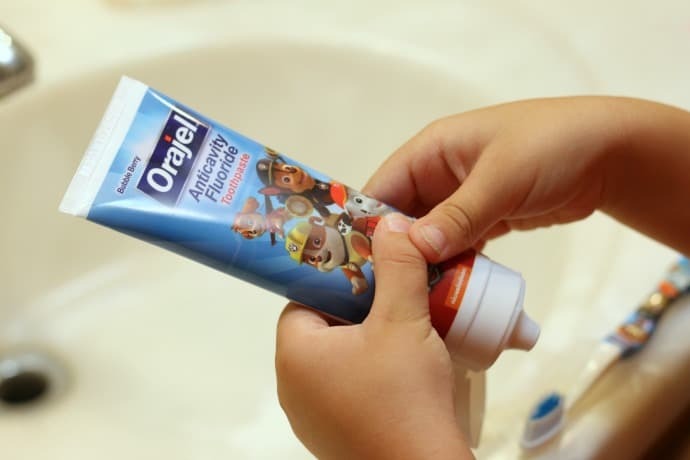 Orajel™ PAW Patrol™ products are a great way to transition your little ones to fluoride toothpaste to help protect against cavities to keep young teeth and gums healthy. A successful brushing routine means splattering it all over the mirror, apparently. 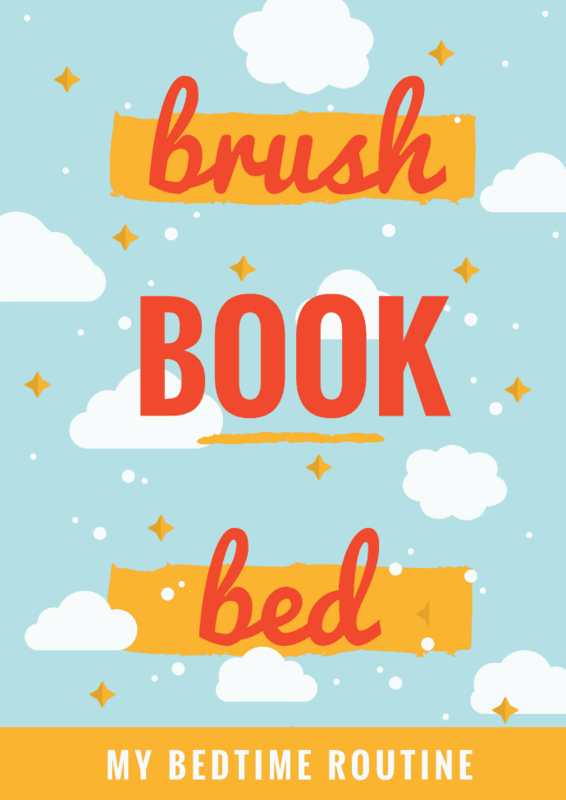 As we get back into “school” mode around here, we are focusing on a simple bedtime routine. Charlie especially likes this one, because it’s easy to remember and he knows the words well enough to pretend he’s reading them. 🙂 I made a printable with the 3 B’s to help the kids remember and get excited about bedtime. It’s silly, but it works! Download this Bedtime Routine printable! 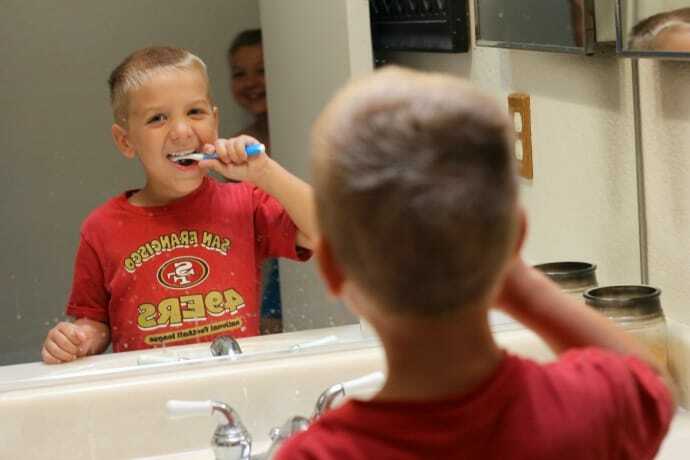 Do you have a bedtime routine for your kids? What are you reading right now-or what would you add to the “top 100” list? We are working through Where the Sidewalk Ends for the second time, but I think A Series of Unfortunate Events will be our next book! « How we Saved Over $300 on a Southern California Vacation! I’ve got to check out that list- we need some new books! We also have a firm bedtime routine. Ours seems to be a bit earlier than most too but my kids, especially my son, needs the sleep. If he misses out on sleep, we feel it for days! We do pajamas, teeth brushing and then split the kids up for reading. My little girl is only 3 months old but we always read The Going to Bed Book, say a prayer with her then kiss her goodnight. I wanted to get a bedtime routine established early to help her know when it’s bedtime and so far she’s a fabulous sleeper (thank goodness)! We read before bed and sometimes they try to sneak in a couple extra books each before bed. I put my grandkids to bed twice a week. We are getting back into a routine since school has started. Reading is the best, they love it! Reading books was our routine before bedtime too. My daughter loved it, but my son wasn’t as interested. They both turned out to be great readers though, so keep making it a priority! Great tips! My kids often complain about going to bed. And thanks for sharing that reading list! We love reading new books. I’m so thankful to have a kid that puts himself to bed! <3 These are great tips and I know I've tried a few of these with my son before! Awww man, I’m hanging my head in shame because we have not been reading in the evenings. 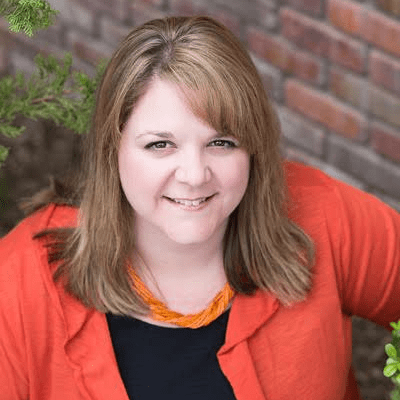 We let life get in the way and are so busy – this post was a reminder to me to get reading to my 5yo again! That printable is too cute! I may have to put that up on the kids’ door. 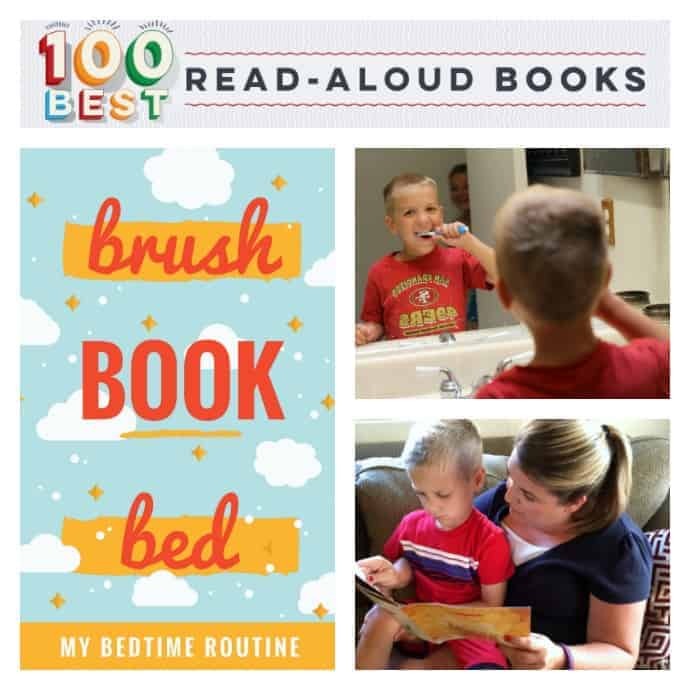 Bedtime routines are so important and as a teacher I’m so glad that reading is part of yours!